With changes in policies of Government, it is important to stay in synch with these amendments. Likewise, intimate your clients or associates who get affected with the same. With introduction of service tax in the system, it is important that you must inform the same to your clients or customers by writing an intimation letter informing them about addition of service tax in the upcoming invoices. 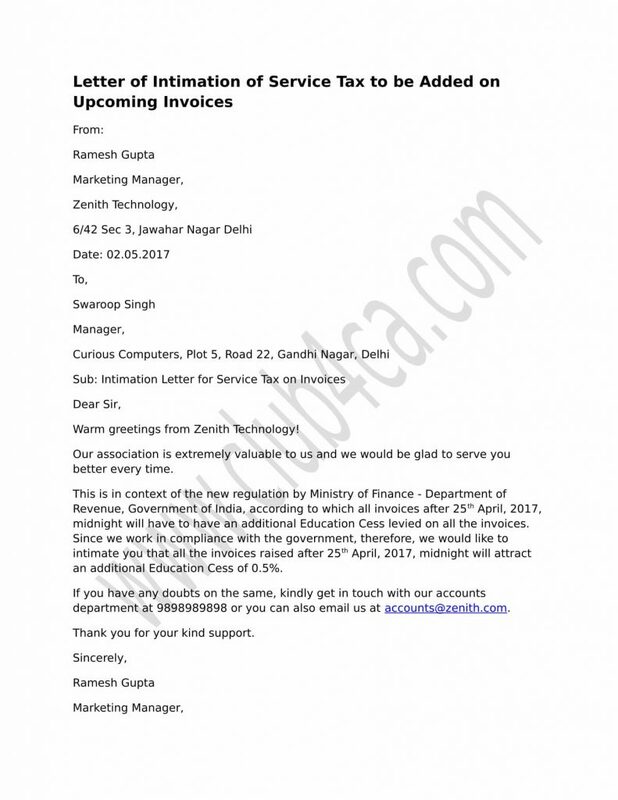 To help you with it, given below is a professionally drafted intimation letter of service tax to be added in all future bills. Use this sample format to write your own letter. Warm greetings from Zenith Technology! Our association is extremely valuable to us and we would be glad to serve you better every time. This is in context of the new regulation by Ministry of Finance – Department of Revenue, Government of India, according to which all invoices after 25th April, 2017, midnight will have to have an additional Education Cess levied on all the invoices. Since we work in compliance with the government, therefore, we would like to intimate you that all the invoices raised after 25th April, 2017, midnight will attract an additional Education Cess of 0.5%. If you have any doubts on the same, kindly get in touch with our accounts department at 9898989898 or you can also email us at accounts@zenith.com.